Blog > Beyond the Backyard > Fort De Soto > The Quest for a Black Belly Concludes? 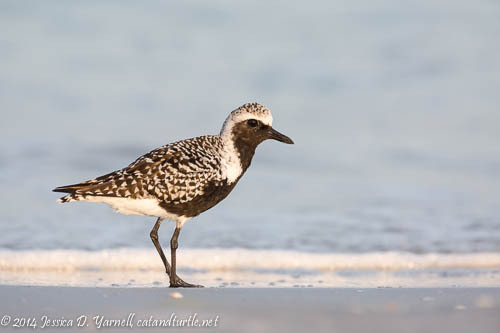 For several years I’ve made trips to Fort De Soto in the spring, hoping to find a fully molted Black-bellied Plover. 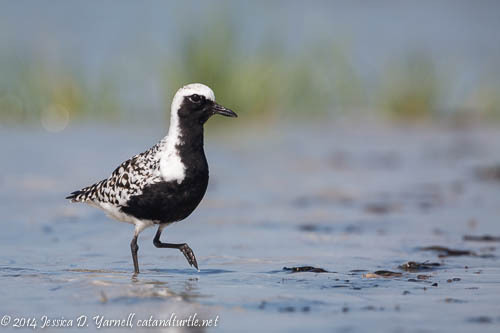 During my quest for a black belly, I’ve photographed the plovers in all stages of molt: their gray winter colors, the first hints of black on their tummies, a partially black tummy and face, and finally a pitch-black tummy with black-and-white face. Most of my photographer friends tell me I’m too picky. 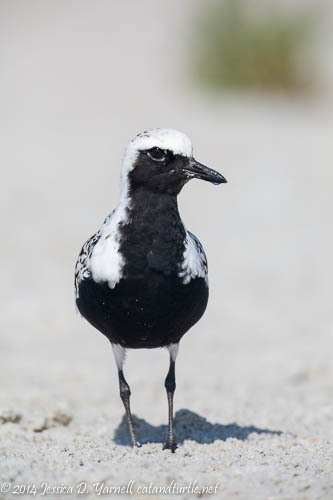 “The bird looks black to me!” Well, when I visited Fort De Soto two weekends ago, I finally found a couple of plovers that were blacker than I’d ever seen. Was my quest for a black belly complete? This bird is looking pretty black, but if you look tot he left of his eye, his feathers still show hints of white. He was definitely blacker than the blackest bird I’d seen last year. He obligingly stayed in one spot for long enough for me to make several images. As a comparison, the bird below is clearly still molting, and you can see larger patches of white showing through his black. He still has a little bit of work to do to attain the full color that will impress his lady friends! Almost Black but Not Quite! A little while later, while I sat photographing the Least Terns and their courtship rituals, I spotted the blackest plover I’d ever seen. 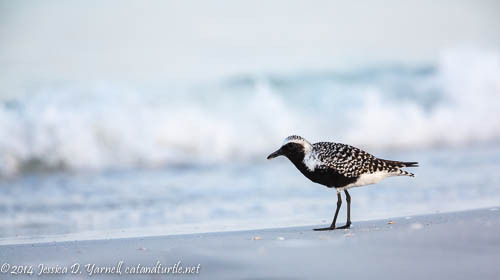 He was scurrying along the beach, and he stopped to say hello to a plover who was nowhere near his full molt. Look at the differences between these birds. 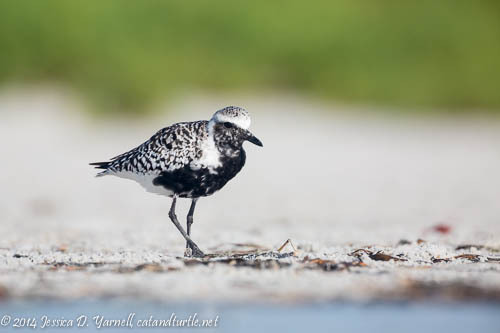 As I didn’t want to disturb the Least Terns, I silently begged the Black-bellied Plover to come closer. Usually birds don’t listen to me when I ask them to do things, but this one did! Actually he came too close for me to focus. What a nice bird! He showed off his midnight-black tummy and face to me and told me that he’s all ready to fly to Alaska to raise a family. Doesn’t he look spiffy? The Blackest of the Black! Actually, if you look to the left of his eye again, you’ll see that there’s a tiny tiny patch that is still not midnight black. So I think there’s still room for improvement next year! The ongoing quest for a black belly is one of the many things that makes it fun to keep going back. You always see something new or different. Someone once said that you could photograph a Great Blue Heron every day for a year and you’d tell a different story with each image. That’s absolutely true!